I created this as a gift for my map-loving cousin who is is part Native American and works in DC as an attorney for the National Indian Gaming Commission. I found out from his wife that he really liked the official maps put out by the US Census, but wanted "something retro" with the same data. That seemed simple enough. Let's see what the data looks like. Thanks to the super useful Census TIGER program, the American Indian and Alaskan Native (AIAN) shapefile was easy to download. Note: In the spirit of honesty and transparency, I'm going to list each significant item that I Googled during the course of the project. Nobody knows everything, so the less we appear like we do, the more encouraging it is for beginners to begin learning. The attributes were a little opaque, but after some searching I found that the MTFCC field was the key attribute for the reservations. Thanks to NaturalEarth Data, basic background information is extremely easy to come up with. I highly recommend using their data for all your small-scale mapping needs. If you asked me to define what "retro" means I couldn't do it. It's one of those "you know it when you see it" things. Because of that, I headed to the trusty Google Image search to look for instpiration. This was a very fruitful search term. A representative sample of "retro maps"
Throughout my various searching and struggling to find a visual inspiration for the map, one map turned up that really captured my imagination. The colors on this map were awesome and exactly what I was looking for! Initially I wasn't sure how I was going to style the reservations, so I began by using the colors to build a subtle, retro background map. At the same time I wanted to utilize some of the cool cartographic features of QGIS which I had never used for cartographic design before. In searching the David Rumsey map collection for stylistic inspiration I kept running into an outlined border gradient style. I thought that would make a nice and unique style for the background so I set out to replicate it in QGIS. In QGIS this was fairly simple thanks to the lovely Shapeburst graphic style as shown. Using that style was easy enough, but I wanted there to be some variation between state borders. For that, I turned to the Four Color Theorem. Thanks to the exhaustive plugins library, it's easy to extend QGIS' functionality. For help automatically processing the four-color theorem I turned to the topocolour plugin. Strangely, QGIS threw a script error, but it worked nonetheless! Now I had one of 5 unique color values for each state border. For the borders I wanted colors that were complimentary to the existing color scheme, but I knew that the bold colors I chose above would look best as the reservations areas. To save myself the trouble of coming up with five more colors in the same theme, I used another one of QGIS' awesome tools - blending modes. Blending modes is a special rendering type where pixels in one layer are mixed together through the settings described here. ...and end up with a beautiful, subtle, retro color scheme. Another major component of a maps style is the font choice. I wanted to give this map a distinctive look, but I wasn't sure which fonts were retro and which were modern. I turned to trusty Google. The restuls were a lot of script fonts, and lots of "distressed" fonts with faux degredation. I was looking for a "crisper" design, so I overlooked those results. Lots of nice looking fonts. The first typeface that caught my eye was was Muncie. However it ended up being a difficult font to work into the design. I briefly tried similar fonts like League Gothic but felt that as a label the tall, narrow design wasn't as readable. From there I turned to Google Fonts. "The old posters and signs in the traditional neighborhood of Buenos Aires called Montserrat inspired me to design a typeface that rescues the beauty of urban typography from the first half of the twentieth century."" "Merriweather was designed to be a text face that is pleasant to read on screens."" A geometric sans-serif display font. After completing the background styles it was time to symbolize and label the reservations themselves. Cartographically, this was actually surprisingly difficult. Here are the issues I ran into. I can tell you from looking that those labels were hand-placed. Oklahoma had the Kiowa-Comanche-Apache-Ft Sill-Apache/Caddo-Wichita-Delaware, (that's the full name!) to the Zia in Arizona. This meant that labeling had to be flexible and contain enough rules so that both long name and short name reservations showed up. The features are multi-part, meaning that one element on the map has multiple pieces. This makes labeling the reservations more difficult because you have to craft label placement rules that prevent repeated labels. There are overlapping reservations. The purple cutout from the Navajo reservation is a Hopi reservation. This will also present labeling difficulties as well. 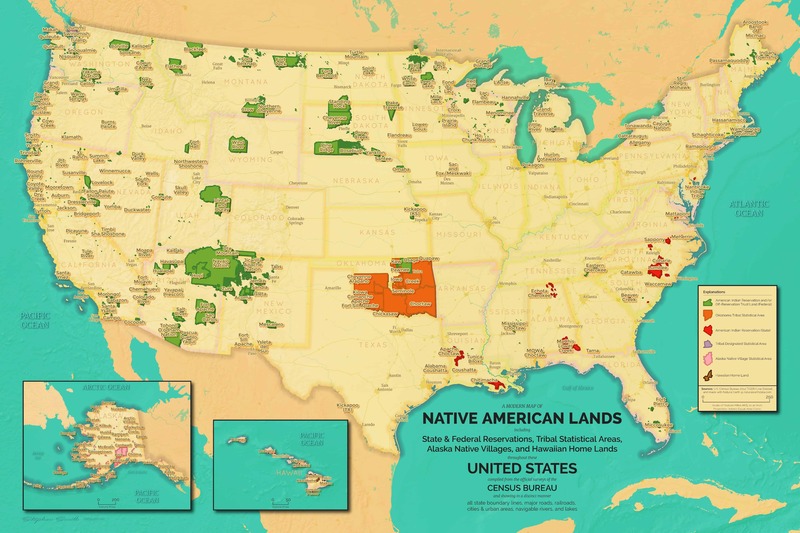 Looking closer at the data, nearly every tribe has both a reservation and an off-reservation land trust. This is yet another challenge for labeling. After some experimenting, I decided to try to give the reservations and pseudo-3D appearance using QGIS' brilliant styling options. I started with a darker shape offset 1px on both the X and Y axis. Then I added an extra-thick border so that all the very small reservations would show up. Then I capped it off with the color picked from the inspirational map above. The labels presented a serious conundrum. As a geographer I wanted to be sure that every element on the map received equal representation. As an American I didn't want to inadvertently disrespect any native tribes. As a layperson on Native affairs I didn't want the map's recipient to call out any errors on the map. As an entrepreneur I couldn't afford to spend the hours and hours it would take to get every label placed perfectly. But as a cartographer I wanted my map to do it's job - show Native American reservations in a cool artistic way. In the end, I decided that my first principle would be legibility. Since this would be a 24"x36" framed canvas, I wanted the reservation names to be visible from 5'-6' away. That meant a large display font. I went with 15pt Montserrat with a 1.5mm halo and a 1.5mm shadow. This created enough visual hierarchy to separate the label from the background and make it legible enough at long distances. With legibility as a guide I setup the rest of the labeling rules so that as many labels as possible were placed without sacrificing readability. I spent a good deal of time trying to get this right. In the end I was fairly satisfied with the tradeoff between accuracy and style. I'm happy to share this strikingly retro map with you completely hassle free! Below is a 5K, high definition version for you to download! Just click the image below to get the 5K jpg for your personal use. It's perfect for all your desktop wallpaper needs. I'm making a limited number of prints available. Are you sure you don't want a print? That's ok, we're still friends. Enjoy your wallpaper!